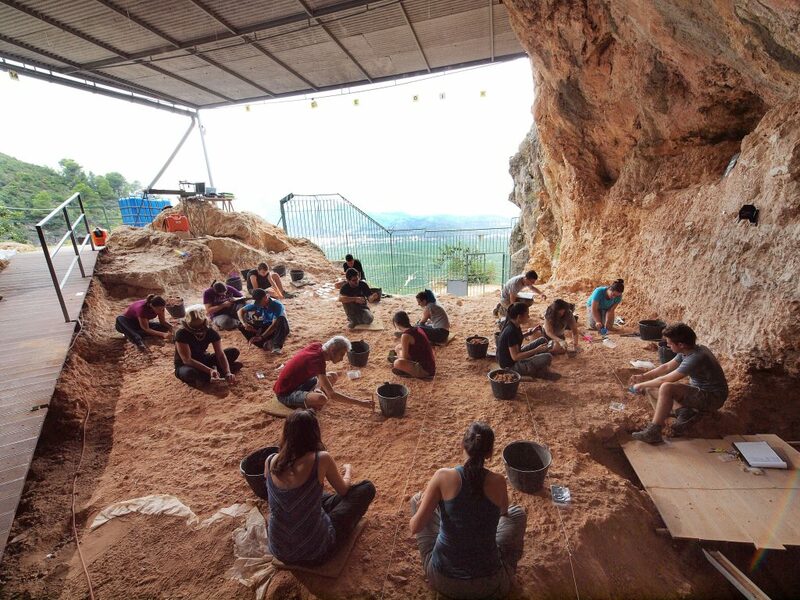 Last weekend ended the XXIX excavation fieldworks in Cova del Bolomor that is held in Tavernes de la Valldigna, financed by the Department of Culture of the Diputació de València, through the Museum of Prehistory and with the corresponding permission of the Department of Education, Culture and Sports of the Generalitat Valenciana. The excavation is carried out systematically and yearly since 1989 under the direction of the archaeologist Josep Fernández Peris. The site has a large chronology covering a large part of the average Quaternary, between 400,000 and 100,000 years before the present. This unique place of Valencian territory has provided the oldest evidence of the controlled use of fire in Europe and an extensive set of human remains of the Neanderthal lineage, along with numerous lithic tools with which processed the captured fauna and the manipulation of wood. This complete record allows the research team to address the most important debates of European paleolithic archeology, such as when the use of fire was generalized, what are the genetic relationships of the middle Pleistocene human groups, what were the patterns of exploitation of the territory or what kinds of lifestyles they developed. In the excavation of this year have participated in two shifts more than forty specialists and students of diverse scientific institutions. The performance has focused on two different chronological moments. At level XIII with an age of 230,000 years the sporadic presence of human groups that had used the cavity with low intensity has been documented. At this level we are waiting to reach the layers where the oldest homes excavated so far were documented years ago. At the upper levels, an area of 15 m2 has allowed to complete the characteristics of the occupations of levels I to III (between 100,000 and 120,000 years before the present). They have an abundant presence of faunal and lithic remains.